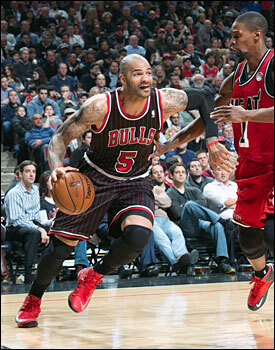 As they have all season, the Chicago Bulls remain focused on winning the next game on the schedule. It just so happens that on Wednesday, the opponent comes in the form of LeBron James and the Miami Heat, winners of 27 games in a row. Following the team’s practice Tuesday at the Berto Center, Bulls coach Tom Thibodeau downplayed the significance of being the team that puts an end to the streak. Kirk Hinrich, who returned to the starting lineup against Portland on Thursday after missing seven games with a right foot injury, agreed that the Bulls didn’t need any of the additional motivation that comes naturally with putting an end to the Heat’s winning ways. Nazr Mohammed, who could make his fourth start of the season if Joakim Noah isn’t able to return to the lineup, echoed that sentiment. As for the status of Marco Belinelli, who missed Sunday’s game in Minnesota with an abdominal strain, and Noah, who has sat out the last two due to a sore right foot, Thibodeau said both are feeling better and will be a game-time decision after participating in some of Tuesday’s practice. Richard Hamilton, still dealing with lower back issues, was more active but did not fully participate. Wednesday will be the third of four meetings between Chicago and Miami this season. The Bulls took the first meeting of this season, a 96-89 win on Jan. 4, behind 27 points and 12 boards from Carlos Boozer, while the Heat won the most recent meeting 86-67 at the United Center on Feb. 21, the ninth win of Miami’s current winning streak. While one could argue the Bulls have a size advantage which was evident in the Jan. 4 win – Chicago held a dominating 48-28 edge in rebounds, 20-7 in second chance points and 19-4 on the offensive boards – Hinrich shrugged off one reporter’s question on whether Miami is a vulnerable team. With very few exceptions, those elements have been consistent for the Bulls during Thibodeau’s tenure, something not lost on his team.